Hello everyone, and welcome to TotA Dev Blog #3! Last week I talked about what it's been like developing a system that blends martial and magic character builds, so today I'd like to focus on what it's been like crafting the lore that gives birth to this feature. 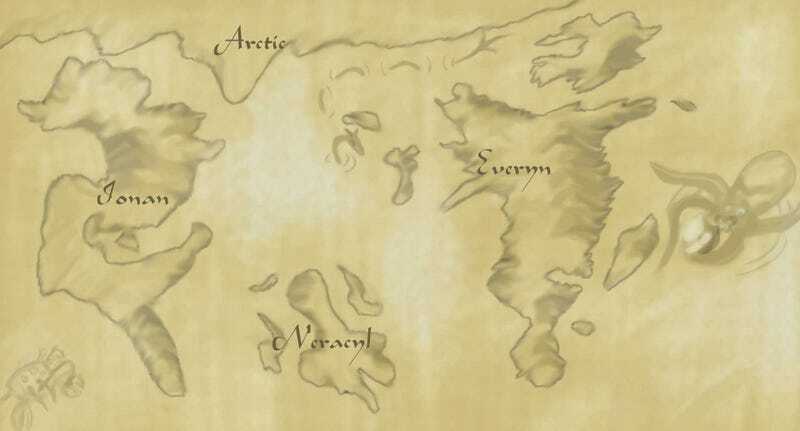 In the earliest drafts, before our game was even called Tales of the Arcanimus, our world was largely similar to any other generic fantasy setting. We had elves and dwarves and orcs and magic. We knew we wanted to let all players use magic in a manner similar to The Elder Scrolls series, but we had yet to decide on the actual device that explained this. Were all player characters somehow touched by fate in some way? Was magical ability just common? Was the potential for this talent somehow a prerequisite to leave one's home and become an adventurer? One of the first questions one must ask oneself when creating a fantasy setting is what place does magic have in it. I have found that there are two common approaches to this question: the first is a low fantasy, rare magic approach. In these settings, magic is incredibly uncommon, to the point where some of the world's inhabitants might even dispute its existence. Magic becomes special, making even a minor spell feel significant to the plot. However, I find that having a main character or player with magical powers often defeats the purpose of this approach; the story becomes surrounded by magic as it follows the characters around. The second approach is a high fantasy, where the world is inherently more magical. Dragons and wizards just fly around doing their thing, and the setting gains a very fantastic feel to it. These settings generally have a much more epic tone, allowing for grand and spectacular moments, but the presence of magic loses some of its luster. Magic is not quite so special when the heroes encounter yet another evil wizard. Because we wanted to establish a tone of mystery to explore by our decidedly magical players, we knew we had to do something to create that rare and mystical quality. Our answer was to create two types of magic; one is the type that players have access to. we deliberately made it so that the world of TotA is completely saturated with it that it is almost commonplace and mundane. You are capable of incredibly feats, but so are many other people. This sets up a very stark contrast with the other magic; and so we have the history for our setting. Long ago, there was magic in this world, but not the kind we know today. Though they were few in number, they wielded dark powers to oppress the land. In their lust for power they nearly brought about the Ultimate Death. The creation of the Arcanimus saved us all. There are some magical abilities that players do not have access to. Old Magic has all but vanished from the world. When an unspeakable horror born of it threatened to engulf the world in chaos and death, a council of sages sacrificed themselves to enchant the world itself, altering the very nature of magic. This enchantment was named the Arcanimus, and it can still be seen across the sky today. It's certainly been an interesting history to write; join me next week as I talk about the histories being discovered, of the New World of TotA and its inhabitants! As always, you can find our Facebook page here. I am planning on organizing a testplay session or three here at TAY as soon as I finish figuring out how to convert roll20.net to the TotA system, so let me know if you are interested in helping!